I cut and fit the new muslin last week. This time I make a size 16. I ended up making the same FBA to the front by adding 3/8” to the front princess seam allowances from hem and then blending in to the seam just above the bust curve. It fits just fine. I don't have a pic at the moment though. This weekend I fit the sleeve. It was tight across the bicep and didn’t have much movement. I checked the measurement and noticed that the bicep measurement on the pattern piece (15 1/8”) is not correct. The bicep actually measured 14 ¾”, so there’s that. My bicep is 13 ½” but 2” ease is the suggested minimum (according to my Jacket’s & Suits patternmaking professor). Also worth noting: the “step” on the elbow seam of the upper sleeve is too low. I corrected it by matching the dots and redrawing the step. 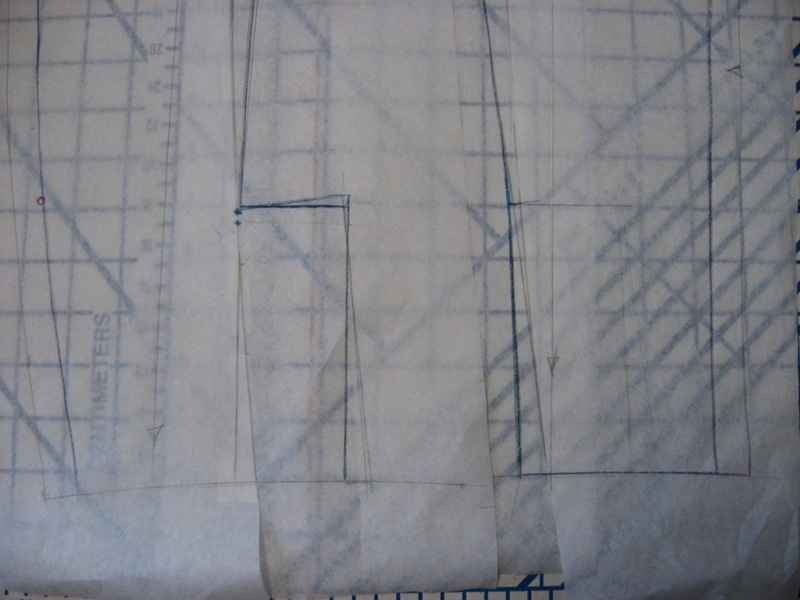 BTW, the step is used in production patterns to line up the top of the elbow seam. Both sleeve pieces should have steps on the top of the elbow seam that match perfectly so that you can line up the first part of the seam easily. The dots aren’t even necessary with a correct step, but I digress. I had been contemplating just going with the 2 piece sleeve but since I’d have to adjust it to fit anyway I figured I might as well make it into a 3 piece sleeve; more on that later. 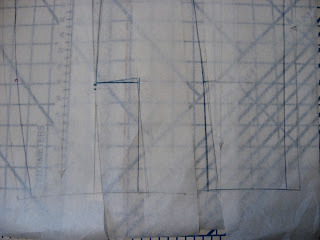 Since I have the new Clair Schaeffer pattern I decided to trace the 3 piece sleeve onto muslin and give it a try. It has more room in the bicep but there is a LOT of sleeve cap ease; too much for the body. I suppose it could be the fact that it doesn’t really belong to the pattern body, but I wouldn’t know unless I muslin that body which I am not going to do at this time. The interesting thing about this sleeve is that all three pieces are quite curved. When the constructed sleeve is laid on a table it doesn’t lie flat and the wrist pops up. Basically the sleeve is shaped to mimic the way our arms naturally curve forward and inward. The curve of the outer seam is so pronounces that I think it makes the arm looks very rounded, which I don’t like. I want slim looking arms please! I think the “odd” grain-line on the front sleeve is intentional to get the grain to appear straight on the front of at the shoulder and especially at the third seam, but the curve kind makes this a moot point. I think it was worth trying and I wouldn’t write it off if I were to make the Claire Schaeffer pattern later. So back to original 2 piece sleeve which I transformed into a 3 piece and increased the bicep approximately 1 ½” total. To do this first marked the bicep line and then I split the upper sleeve in half vertically (parallel to the grain-line) from the shoulder seam notch and then gently curved the line toward the front below the elbow so that it bisected the wrist in the middle. I taped each half to some extra paper and then added 5/8”~3/4” at each bicep point and used my hip curve to blend into the shoulder point and wrist. Then I added the canted sleeve vent under-lap on the back piece. I haven’t yet, but before I cut the fashion fabric I will cut muslins of this new sleeve and to check the fit once again. In the meantime, I’m preparing the body panels for quilting. 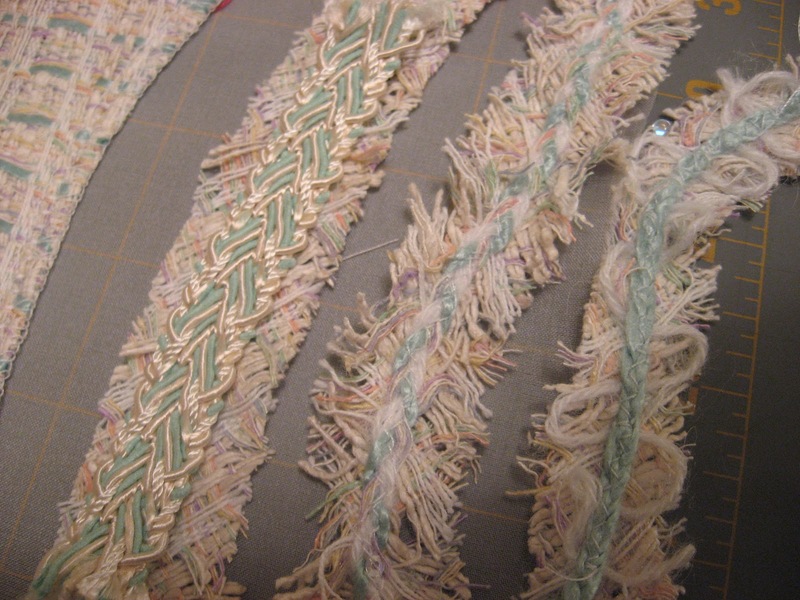 This involves 1) thread tracing the pattern piece using a single strand of red dmc embroidery thread; 2) placing a silk organza armhole stay under the side front and back panels; cutting a square of silk jacquard lining and pinning it to the underside of each panel being careful to preserve the grain-line of all pieces. I got all 4 armhole panels completed last night so I think I should be able to do the center back and center fronts tonight. Then I will move onto the quilting phase! I am super excited about the quilting part. It means I will finally get to justify my walking foot purchase (although I already used in on a mini quilt) and I’ll get to see how the hand of the fabric changes when the lining layer is added. 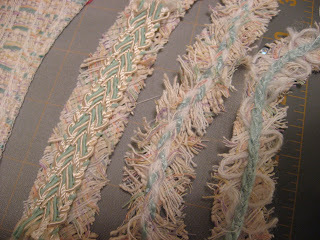 I also got out my trim again and started looking at it on top of some pieces of bias that I cut. It makes me very excited about this project!! I’m trying to be cool about it though. I don’t want any perceived setbacks to ruin the rhythm I’ve got going on.